Is China Trying to Split ASEAN? China doesn’t want a military conflict over the Scarborough Shoal. A clash now would only unite ASEAN. Defense leaders from around Southeast Asia are meeting in Phnom Penh this week for the 6th ASEAN Defense Ministers’ Meeting (ADMM). The theme of the get together – “Enhancing ASEAN Unity for a Harmonized and Secure Community” – smacks of doublespeak: unity and harmony within ASEAN are sorely lacking at the moment, and no-one really thinks the ministerial meeting is going to rediscover them. In the anarchy of the international arena, a club like the Association of Southeast Asian Nations ought to be a reassuring place to be. The organization gives its ten members – small or medium-sized players in geopolitical terms – the opportunity to close ranks when dealing with the greater powers, and to speak with one voice loud enough to be heard in Beijing, Washington and any other place that needs to listen. Unfortunately, ASEAN doesn’t work like that: individualism swiftly trumps collectivism whenever contentious issues arise. In particular, ASEAN has a China problem. Ask the ten members about China, and you’ll get a kaleidoscope of opinions about what that country represents. Some ASEAN countries are very much pro-China: their own economic development is tied closely to Beijing’s, and they are comfortable with the political implications of their China connections. Others are cooler on relations with Beijing: they balance a wariness of Chinese influence with the obvious benefits of a healthy trading relationship. And finally, there are those that feel threatened by China and regard themselves as targets (or at least potential targets) of Chinese assertiveness. Unity on the question of how to handle China has therefore eluded ASEAN. And given the association’s nature, this is unsurprising: neutrality and non-intervention, not unity and collectivism, are ASEAN’s most cherished principles. Nonetheless, it’s clear that the member states which feel most insecure about China – the Philippines and Vietnam – had hoped for at least some ASEAN solidarity in managing their territorial disputes with Beijing in the South China Sea. They didn’t get it. Philippine proposals in 2011 for the creation of an ASEAN-China “Zone of Peace, Freedom, Friendship and Cooperation” in the South China Sea were hung out to dry by the other ASEAN countries, with only the Vietnamese expressing real support. Most instead backed a bilateral approach to arguments with China: in other words, they said they’d rather not get involved. As the stand-off between China and the Philippines at Scarborough Shoal – a disputed territory in the South China Sea – comes close to entering its third month, there’s certainly hope that diplomacy might still provide a solution to the complex problem of China-ASEAN tensions. This week’s ADMM could make some headway. More significantly, ASEAN officials last week completed a draft version of a new Code of Conduct governing behavior in the South China Sea; once finalized internally, this will be presented to China for discussion over the summer, though Beijing is presumed to have already had some unofficial input. However, in ASEAN’s security discussions China has become the elephant in the room. At the ADMM, China is quite literally in the room: Defense Minister General Liang Guanglie is attending the event in Phnom Penh, even though this isn’t a gathering of the ADMM Plus, of which China is an official member. As for the drafting of the new Code of Conduct, there are concerns that the proposed regime will fail to take the all-important step: the setting out of clear rules in disputed zones. China is the constraining factor, with the draftees wary of presenting Beijing with a code that it cannot accept. But equally, drafting a code that fails to get to the heart of the South China Sea’s problems would be to squander a once-in-a-decade opportunity. There’s no doubt that ASEAN is split on the issue of China and territorial disputes. What is less clear is whether ASEAN’s disunity is simply playing into China’s hands, allowing it to deal with each country individually, or whether Beijing is actively driving a wedge between ASEAN members that oppose China and those that are more sympathetic to the Chinese position. “Beijing has consistently pursued a strategy to prevent the South China Sea issue [becoming] one between China and ASEAN,” suggests Zhang Baohui, an associate professor at Lingnan University. “It has argued that the any conflict is bilateral. To this end, Beijing has succeeded by using a few Southeast Asian countries to prevent the emergence of a united ASEAN agenda or strategy.” Zhang points to China’s economic leverage over Cambodia and Thailand in particular, and also to the fact that these two countries (and several others within ASEAN) have no direct stake in the South China Sea disputes. Their membership of ASEAN is their only real link to these affairs. The spotlight has fallen on Cambodia especially: the country is China’s closest regional ally and a major beneficiary of economic aid from Beijing. It’s also the current ASEAN chair, which has given rise to suggestions that China is currently exerting undue influence on ASEAN through Cambodia at what it obviously a sensitive time for China-ASEAN relations. Irrespective of the extent of Beijing’s control over Cambodia, its ability to split ASEAN – whether intentional or coincidental – is undeniable. 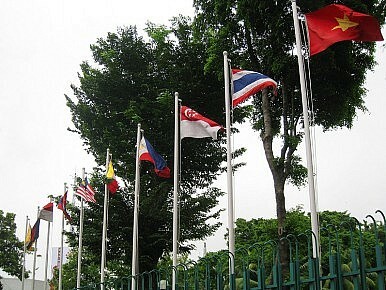 However, China is also one of the few issues with the power to unite ASEAN. According to Mark Thompson, director of the Southeast Asia Research Centre at the City University of Hong Kong, non-intervention remains central to the ASEAN philosophy, with the result that ASEAN members are naturally in favor of balancing the competing influences of the US and China. China’s involvement in ASEAN constrains the group’s behavior, and militates against unity. But equally, China’s involvement in ASEAN is a self-constraint: only by treading relatively softly can Beijing continue to handle territorial issues bilaterally, as it prefers, as opposed to having to tackle ASEAN en bloc. So for all the damage that the long-running stand-off at Scarborough Shoal might be inflicting on ASEAN, it is at least encouraging to conclude that military action in the South China Sea is not in Beijing’s playbook. China can only divide and conquer ASEAN politically, not militarily. The Philippines is hopelessly mismatched against China in pure military terms. But there are historical reasons why it won’t back down in the South China Sea.